There are certain features on a woman's face that create a feeling of femininity, confidence and beauty: long fluttering lashes, gorgeous arched eyebrows and of course, luscious lips! Applied as easily as your favorite lip gloss, Renew Lip Plumper invigorates lips with a burst of tingling peppermint-like sensations. Within seconds, lips plump up with irresistible volume. 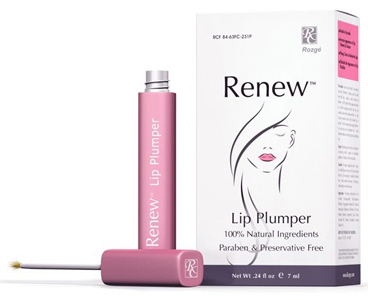 Not only does Renew Lip Plumper leave lips with a silky shine, it also restores lips with necessary moisture for a healthier pout. A natural, non-surgical way to have plump, full lips! Instructions: Apply like lip gloss.